North Cascades National Park has a wide variety of ecosystems, from glaciers (more than 300 of them) and mountains, to lakes and rivers, to temperate rainforests, marshes and swamps. While hiking its renowned trails, listen closely for the distant sound of rushing waterfalls, for these beautiful features are what gives the park its name. The North Cascades National Park administration also manages Lake Chelan and Ross Lake National Recreation Areas. The different geographic areas are connected by the Stephen Mather Wilderness. 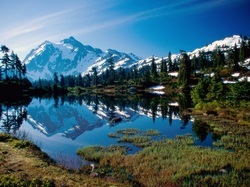 North Cascades National Park offers a wealth of activities. With some of the finest mountain country in North America, the park has many great hiking trails. April through October is the most popular season for hiking. The Agnes Gorge Trail is an easy 2.5-mile trail near Stehekin. The trail overlooks the gorge and features blooming wildflowers like tiger lilies, lupine, and wild roses in early to mid-summer. The trail ultimately leads visitors to beautiful cascading waterfalls, where the roar of the rushing water drowns out all other sounds. North Cascades National Park is renowned for its rugged climbing terrain, which includes mixed mountaineering routes, glacier travel, technical ascents and scrambling. Backcountry permits are required for all climbs in the park, as well as overnight stays. Permits are free and can be obtained at the Wilderness Information Center in Marblemount, or the closest ranger station to your trailhead.Cascade Pass is one the of the park’s most popular climbs. The Sahale Arm Trail section of the pass is the most strenuous, and requires an ice axe for safe travel as late as July. It’s a good idea to check the trail conditionsbefore embarking on any extended journey into the wilderness. The park is open year-round. The Park and Forest Information Center is the park’s headquarters and main visitor center. It is open all year, but many of the other visitor centers are closed during the winter months. The park charges no entrance fee. North Cascades National Park has a variety of camping and lodging options. There are five car-accessible campgrounds, many boat-in campgrounds, and more than 140 backcountry campsites available. Campgrounds range from $10 to $12 per night. All backcountry camping is free, but requires a permit. The park itself does not operate lodging facilities, but private concessionaires provide many places to stay within the park. From temperate rain forest to ponderosa pine highlands, North Cascade National Park’s diverse ecosystems are home to many threatened and endangered species. Among them are the bald eagle, gray wolf, grizzly bear, harlequin duck and North American lynx. The gray wolf, once common from Alaska to Mexico, is now a rarity in the North Cascades.Human aggression towards predator species and government bounties contributed to the overhunting and decline of the gray wolf. There were thought to be no more wolves in the area until in 1984, when some were spotted near Ross Lake. This caused a bit of excitement, since the wolves returned on their own, without any reintroduction efforts on the part of the National Park Service. DNA evidence links some wolves in the park with those found in British Columbia. The North Cascades were inhabited by native people long before fur trappers came to the region in the 1700s. These fur traders were among the first Euro-Americans to explore the North Cascades area. The trappers sought the pelts of beavers, bears, cougars, wolves, lynx, foxes and other animals. The 1850s brought miners and loggers to the area. Prospectors searched for gold on the banks of the Skagit River and along Ruby Creek. In the 1870s, gold was discovered near Ruby Creek, and as a result, prospectors swarmed into the area. Most left disappointed, since little gold was found. Afterwards, the area was used for silver and lead mining, but the costs of obtaining the metals outweighed their market value, and mining died down. World War I and World War II lead to spikes in demand, but for the most part, mining in the area remained intermittent. “Short working seasons, unpredictable weather conditions, difficult transportation, limited accessibility and lack of working capital were all factors that hampered the development of large-scale mining in the North Cascades,” according to the National Park Service. Lyndon B. Johnson signed the North Cascades Protection Act in 1968, officially establishing North Cascades National Park. 1814 – Alexander Ross is the first Euro-American to cross the North Cascades. 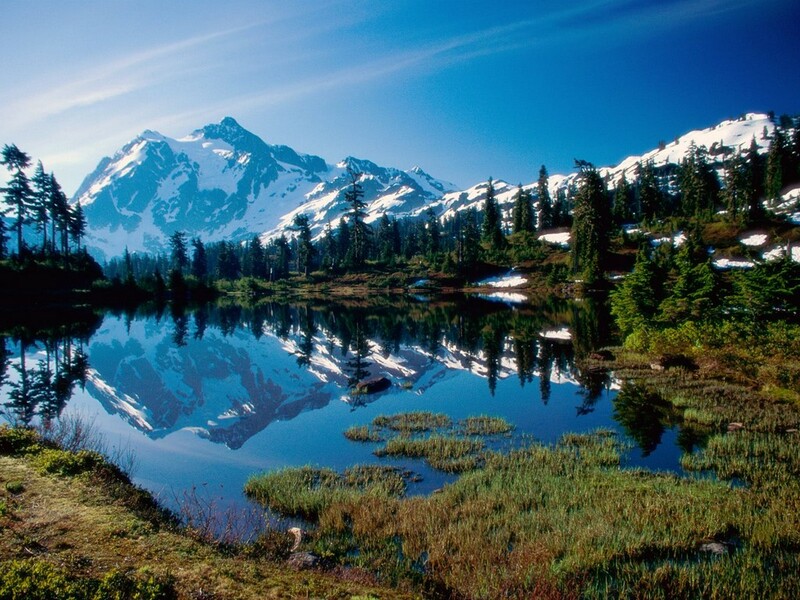 1964 – The Stephen Mather Wilderness, which makes up 93 percent of the North Cascades National Park is established. Click to see a detailed North Cascades National Park map.